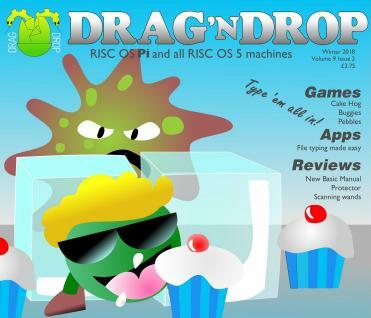 The latest edition of Drag'n'drop is now available online to purchase. If you are not familiar with the magazine, it is a nice mix of news, tutorials, reviews and type in apps, utilities and games (you can buy the listings to avoid the typing). It reminds me very much of the 1990s style Acorn magazines. There are also adverts for shows and equipment. The magazine if provided as a PDF file, which also has the advantage that news and other items can contain links. It can be read on any machine or printed out. This edition includes a wide selection of reviews covering the updated BBC BASIC Reference Manual, the new Protector game, a wireless keyboard and mouse, and a nifty little magic wand scanner. There are 3 type-in games (Cake Hog, Buggies and Pebbles), complete with nice explanations of how the code works. A nifty little SetTyper application completes the programming section. So, something for everyone and a great selection of material to keen you engaged and entertained.